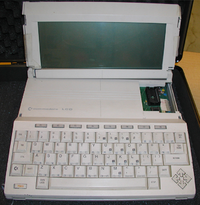 The Commodore LCD (abbreviated CLCD), is a prototype 8-bit computer with a Liquid Crystal Display (LCD) by Commodore Business Machines. The CLCD was developed in late 1984 and first presented to the public at the January 1985 Consumer Electronics Show (CES) in Las Vegas. Following the break-up of the Plus/4 project teams, a number of personnel worked on minor projects that could be developed further. One of these was implementing an LCD screen. Commodore Semiconductor Group (CSG) had an optoelectronics division (at 4350 Beltwood Parkway South, Dallas, Texas, 75234) where research and manufacturing for LCD digital watches took place. In fact, this was the only LCD glass manufacturing company in the USA at that time. Along with portability, there was the intent to include a modem. It is believed that Commodore’s CEO, Marshall Smith, spoke with the CEO of Tandy about the future of LCD products. When Smith was told that LCD would be going nowhere, he cancelled the project. With no need then for LCD technology, and no real calculator or watch production going on at Commodore, Smith sold-off the entire LCD division. There are rumoured to be 5 machines in existence, however only 2 are verifiable. 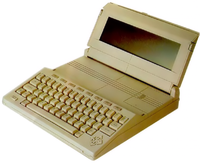 Bil Herd worked on the initial architecture for the CLCD project and also designed the unimplemented MMU, before being moved to the team developing the C128. Jeff Porter, a self-confessed C64 hacker, from AT&T was the modem expert and became leader of the project team when Herd was moved. Ian Kirschman was a lead on the project. Hedley Davis, Judy Braddick, Andy Finkle, and Carolyn Scheppner were coders. The CLCD was to be "a utilitarian computer for those of you who need a small, light, portable computer for use on the road, in the classroom, or simply in a remote room in your house". Jeff Porter has stated that he was recruited by Commodore to design "the machine you'd want for yourself" . It was not meant to be a laptop computer, but more of a notebook computer. Although there was no external video output, Jeff Porter stated that "his team was thinking about a cartridge for the C=LCD which provided 80 column display for an external video display, using the C128's video chip"
Wordprocessor: A fully-featured word processor with justification options, search phrases, headers and footers, underlined and in bold text, centering, cutting and pasting, and storage. Operates in split screen mode. Spreadsheet: A-fully-featured spreadsheet similar to Microsoft's Multiplan. Terminal: A telecoms package, which works with the built-in built-in 300bps auto answer/auto-dial modem. It can send and download files, it has a buffer interception and auto-managing by phonecall be associated with a built-in address book. All parameters can be modified. It can emulate both the DEC VT52 & VT100 terminals. BASIC: BASIC 3.6 is almost downward compatible with BASIC 7.0; however commands such as COLOR or system-specific POKEs will not work. Herd Dissects a Commodore LCD, accessed 10 Sep 2015. ↑ MJK's Commodore LCD Page, accessed 5 September 2015. This page was last modified on 10 October 2016, at 22:52. This page has been accessed 4,832 times.